A line of harnesses with a standard, clean cut designed for straightforward work applications and basic use. They are easy to use, give appreciable freedom of movement once fitted and have an adequate level of comfort. The zinc-plated steel components are corrosion resistant and hard-wearing, while the high-tenacity polyester strap is characterised by a strong weave giving a high level of resistance to tear and abrasion for extended life. A basic harness, easy to fit and adjust. ATTACHMENT POINTS: Device with two attachment points for fall arrest, one on the rear and one on the front (obtained by connecting two semi-attachment points A/2). The large, functional dorsal hook is made of forged steel. 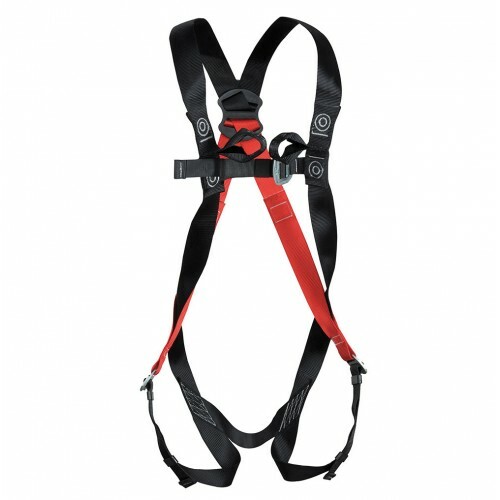 Dorsal and sternal attachment points A/2 device with two attachment points for fall arrest.